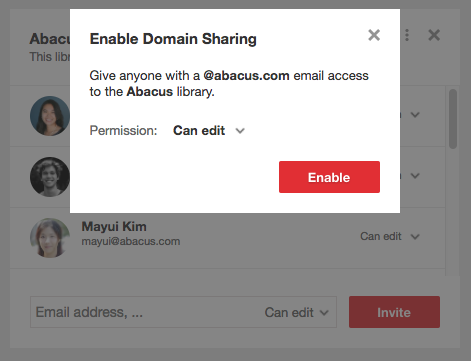 We've made it simple to share a library with your entire team by setting a team library to be accessible to anyone with an email address at your domain. Just enable domain sharing from the library sharing dialog and existing and future users with an email address at your domain will be automatically added. You can also select the permission to grant each user that is added via domain sharing. This makes it even more effortless for your entire team to quickly get access to your team's knowledge without having to manage sharing permissions.